Food dehydrators are a staple in the healthy kitchen! 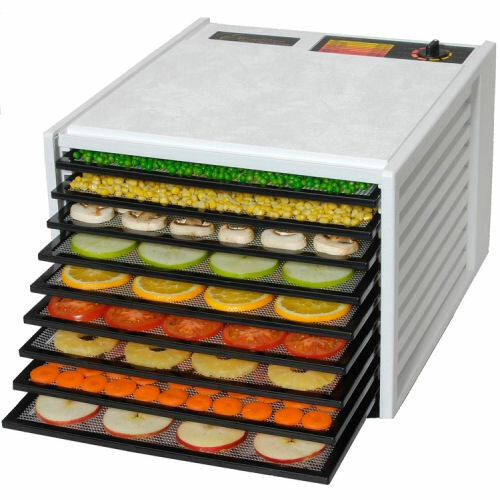 From dieters trying to conserve calories to food purists who want to enjoy delicious foods that aren’t riddled with preservatives and other unnatural chemicals, health-minded people are now bringing home top model food dehydrators. You know fresh produce is great for your body because they are packed with natural vitamins, minerals, and enzymes. Unfortunately, a lot of fresh produce goes to waste because people simply don’t eat it up before it goes bad. Food dehydrators are the solution to this problem. You will never again waste money by throwing out rotten fruit! You can use your dehydrator to remove the moisture from these foods so they are preserved naturally. Dehydrated foods will last much longer than those that are left fresh and they can be used in a variety of healthy snacks. Consider adding dehydrated fruit pieces to yogurt or mixed in with nuts for a homemade trail mix. Even children will eat foods that have been processed through food dehydrators! They will eat their fruits happily without even realizing they are so good for them. You may even be able to dehydrate very small pieces of vegetables and slip them into a dehydrated fruit mix for those veggie-hating family members! The Metrokane Citrus Juicer family is extremely well known and includes the Might OJ Citrus Juicer, the best selling manual citrus juicer in the world. The range has a model for every budget including the new ‘L’ press juicer, a brand new design. Wonderful for fresh orange or grapefruit juice first thing in the morning, and don’t forget lemons and limes for the distinctive taste of good old fashioned, home made and healthy lemonade. 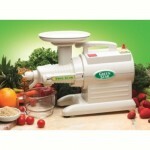 Vegetable Juicers: Which One Should You Choose? There are three basic types of fruit and vegetable juicers and within those, many design variations, so there is certain to be one which will fit into your lifestyle and budget. All juicers separate the pulp from the juice; the difference is in the way that separation takes place and how much of the vitamin and mineral goodness of the fruit is retained in the juice. 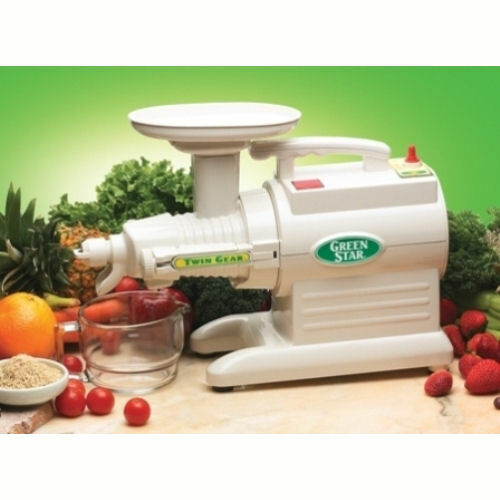 A Twin gear juicer typically extracts the most goodness, and gives the highest juice yield. It will process most fruits and vegetables including wheat grass and other green, leafy vegetables and with the addition of attachments can often be used to make other healthy foods; pasta, peanut butter, and baby food. A Masticating juicer is not as efficient as a Twin Gear juicer; but the masticating juicer can still handle a wide variety of fruits and vegetables as well as wheatgrass and other leafy greens, and has the advantage of being generally less expensive than the twin gear models. Some models can also function as a food processor making it easy to create more meals from scratch and avoid the additives in processed foods. A Centrifugal juicer is the least expensive model of the fruit and vegetable juicer on the market, but has a lower yield from most fruit and doesn’t work very well on leafy green vegetables, wheat grass or herbs. Because of the high speed of these juicers, many consider the juice produced to be of inferior quality to that produced by a twin gear or masticating juicer. 2012 Copyright FreshStartJuicers.com. All Rights Reserved.